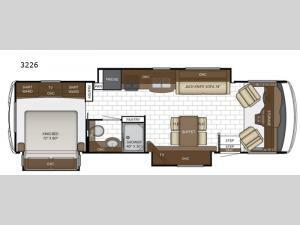 You can go on any road trip or adventure with this 3226 Bay Star Sport class A motor home by Newmar. Throughout this model there are triple slide outs which help to open up the floor space. At the free-standing table there are two regular chairs and two folding chairs. Additional seating space can be found at the 74" jack knife sofa. When you are ready to retire for the evening then come retreat to the rear bedroom where you will find a king bed.